candy sauce, juice, medicine, cosmetic and oil bottle etc. The air system has been divided into two parts: Pneumatic action part and bottle blowing part . It can provide sufficient and steady high pressure for blowing irregularly shaped large bottles. The machine is small with low cost, easy and safe to operate. And it meets the need of beverage manufacturer, polyester bottle producer in city and countryside and is ideal bottle blowing equipment for water bottle. Main machine: composed of machine body, closing structure, sealing stretching, and blowing machine, all together four parts. 1. Closing structure is composed of fixed mould plate, moving mould plate, cylinder, and double bending arms and connecting poles. The air source is controlled by the helping of the connecting poles and double bending arms; the plates open and close thereby. 2. The sealing stretching is controlled respectively by two left/right cylinders independently, conducting left and right stretching and sealing. It is also controlled by two solenoid valves of two position and five routes. They can adjust the air blowing retention time of the two cylinders respectively. 3. The air source comes from the second level filter first, and then goes to two big size two-position-three-routes solenoid valves to blow high-pressure air to make bottles from perform . 4.The operation screen is installed with microcomputer controller. It has LCD displaying function, manual or automatic functions switches. They control the time of opening and closing of mould, sealing stretching and blowing. Easy and convenient to operate. 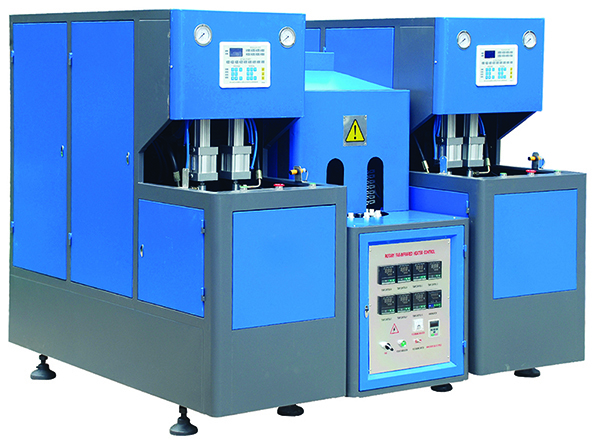 1200-1600BPH Micro-computer Semi-Automatic Hallow Four cavities Blowing Machine is the new equipment which produces plastic hallow containers of PET. It has the advantages of energy-saving, small size, low investment, (fast money back), efficient, and reasonable structure and is widely used in food, medicine, cosmetic, pesticide-killer, chemical and beverage packaging industries. 1. Equipped with microcomputer control, easy to operate. 2. Heating part is IR heating tube, controlled by imported controlling silicon. The moving part is equipped with three phases motor, and drived by frequency changing part. 3. There are left and right cylinders in sealing stretching part. the stretching length can be adjusted automatically, and the time for air blowing can be adjusted freely. the bottle blowing can benefit from doing so. 4. The waste air can be exhausted from a silencer inside the machine. It reduces the possibility of creating water drop, and is prevented from making noise. 5. There are two air storage barrels inside the main machine and one high, one low, pressure-reducing valve.